2019 Nissan Rogue for sale serving Newark, Elizabeth, Union, Irvington, NJ 5N1AT2MV2KC750932 - Route 22 Nissan. *The Smart Way To Buy! * *Are you tired of hidden fees and bogus rates ruining your search process? Now there's a way to avoid all of the nonsense. Introducing the smart way to buy™ from Route 22 Auto's. The advantages of the smart way to buy™ are endless. There is no pressure throughout your search. You can finally feel at ease when purchasing a car. Since there are no hidden fees, there are no surprises or gimmicks revealed when you finally make a decision. Route 22 Auto’s salespeople are direct and value your time, so there is no back and forth or confusion. They know it's necessary for you to feel comfortable during the buying process and want to be trusted. The smart way to buy™ is smart for a reason. The team at Route 22 Auto's does Internet research every day to discover the right price for you. They make sure to look at competitors' pricing and numbers from industry experts so you can feel confident that you're getting the best offer possible. The main factors that contribute to your final cost are market value, product availability, days' supply in the market and the product age, color and equipment. It's easy to feel secure with the smart way to buy™. * This Nissan includes: * [L92] FLOOR MATS * Floor Mats * [B92] BLACK SPLASH GUARDS (SET OF 4) (PIO) * [U01] PREMIUM PACKAGE * Smart Device Integration * Tires - Front All-Season * Chrome Wheels * Mirror Memory * Tires - Front Performance * Aluminum Wheels * Navigation System * CD Player * Heated Steering Wheel * Steel Wheels * Seat Memory * Back-Up Camera * Leather Steering Wheel * Adaptive Cruise Control * AM/FM Stereo * Satellite Radio * Tires - Rear Performance * Bluetooth Connection * Auxiliary Audio Input * MP3 Player * Tires - Rear All-Season *Note - For third party subscriptions or services, please contact the dealer for more information. * This SUV gives you versatility, style and comfort all in one vehicle. Stylish and fuel efficient. It's the perfect vehicle for keeping your fuel costs down and your driving enjoying up. This AWD-equipped vehicle will handle beautifully on any terrain and in any weather condition your may find yourself in. The benefits of driving an all wheel drive vehicle, such as this Nissan Rogue SV, include superior acceleration, improved steering, and increased traction and stability. Where do you need to go today? 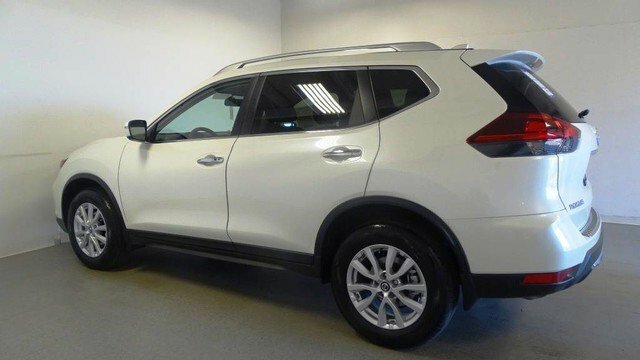 Just punch it into the Nissan Rogue on-board navigation system and hit the road.